As the number of overdose deaths continue to climb, one would think that every addiction treatment center in the United States would be busting at the seams and racing to expand their programs. Instead, many centers are fighting for survival, and far too many are losing the battle. Addiction treatment center owners are fighting a perfect storm of shrinking reimbursement rates, rising insurance deductibles and a wave of negative publicity about shady operators and unethical practices. No one is mourning the crackdown on unscrupulous treatment centers. However, far too many independent treatment centers being run by truly caring individuals are being forced to shut down. The problem is that without the ability to differentiate excellent treatment centers from those with mediocre results, addiction treatment has become a commodity. And everyone is being tarnished by the bad actors. The answer is simple -- the addiction treatment industry must overcome its aversion to measuring and reporting its outcomes. The Joint Commission is requiring its accredited organizations to start down this path by using patient-reported data to monitor how patients are responding during treatment. CARF is expected to follow suit within the next year. But the real definition of success is the percentage of patients who remain in active recovery one year after treatment ends. Once armed with this data, effective treatment programs can use it to negotiate higher reimbursement rates and pay-for-performance bonuses with payers. They can also choose to voluntarily publish their results on outcomes-oriented sites like Conquer Addiction so that private-pay clients looking for programs with the best success rates will find them. However, the future looks bleak for practitioners who aren’t willing to prove whether or not their treatment program really works. The truth is that the only way a commodity can compete is by reducing its prices even further. 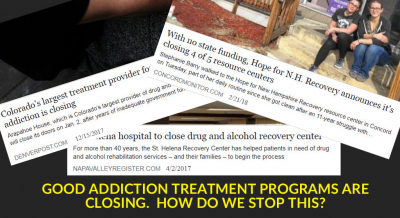 We can't afford to lose any more good addiction treatment programs. Please start generating the data you need to prove how effective your treatment really is.